For other uses, see Cloak and dagger (disambiguation). "Cloak and dagger" is an English term sometimes used to refer to situations involving intrigue, secrecy, espionage, or mystery. The phrase has two possible origins. One dates from the early 19th century, and is a translation from the French de cape et d'épée and Spanish de capa y espada (literally "of cloak and sword"). These phrases referred to a genre of swashbuckler drama in which the main characters literally wore these items. In 1840, Henry Wadsworth Longfellow wrote, "In the afternoon read La Dama Duende of Calderón - a very good comedy of 'cloak and sword'." Charles Dickens subsequently used the phrase "cloak and dagger" in his work Barnaby Rudge a year later as a sarcastic reference to this style of drama. The imagery of these two items became associated with the archetypal spy or assassin: The cloak, worn to hide one's identity or remain hidden from view, and the dagger, a concealable and silent weapon. In historical European martial arts, the term can be taken literally, and refers to wielding a dagger in one hand and a cloak in the other. The purpose of the cloak was to obscure the presence or movement of the dagger, to provide minor protection from slashes, to restrict the movement of the opponent's weapon, and to provide a distraction. Fencing master Achille Marozzo (whose illustration is seen at right) taught and wrote about this method of combat in his book, Opera Nova. 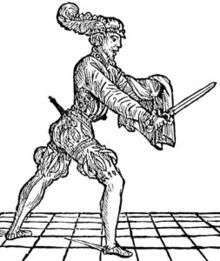 Fighting this way was not necessarily seen as a first choice of weapons, but may have become a necessity in situations of self-defense if one were not carrying a sword, with the cloak being a common garment of the times that could be pressed into use as a defensive aid. Both Marozzo and other masters such as Di Grassi also taught the use of the cloak with the rapier. The sword fight in Peter Martins' ballet of Romeo + Juliet culminates in Romeo stabbing Tybalt repeatedly in the back with a dagger, having flung his cloak over the latter's head. ↑ Dickens, Charles (1841). Barnaby Rudge: A Tale of the Riots of 'Eighty. London: Chapman & Hall. p. 203. ISBN 0-14-043728-2. ...his servant brought in a very small scrap of dirty paper, tightly sealed in two places, on the inside whereof was inscribed in pretty large text these words: A friend. Desiring of a conference. Immediate. Private. Burn it when you've read it. "Where in the name of the Gunpowder Plot did you pick up this?" said his master. "It was given him by a person then waiting at the door", the man replied. "With a cloak and dagger?" said Mr Chester. ↑ DiGrassi, His True Arte of Defence The entire Di Grassi manual translated into English. ↑ UNC.edu A version of "The Rapier and Cloake" that is easier to read and includes an illustration.